If you often find yourself running after a bus, escaping a burning building or taking part in competitive athletics in high-heeled footwear, you may be storing up knee problems for later in life, according to a study published this month in the International Journal of Biomedical Engineering and Technology. 9 out of 10 wearers of high-heels report associated soreness, fatigue, numbness and bunions when wearing such footwear. Despite this, the wearing of high-heels apparently represents an ongoing fashion statement. It gives the wearer a shorter stride, a purportedly more graceful gait and a superficial "shaping" of the leg towards the slender. It is perhaps no surprise then that given the perception of increased attractiveness and an apparent boost to self-confidence that high-heeled footwear remains popular despite the pain. Now, Yaodong Gu, Yan Zhang and Wenwen Shen of the Faculty of Sports Science, at Ningbo University, in Zhejiang, China, have demonstrated that there are additional long-term risks for wearers of high-heels who find themselves regularly having to run. The team measured the hip and ankle movements in young women running in different types of footwear - flat shoes heel (15 mm heel), low heel (45 mm) and high heels (70 mm). The team observed an increased motion of range of knee abduction-adduction and hip flexion-extension while the volunteers where running in high heels. 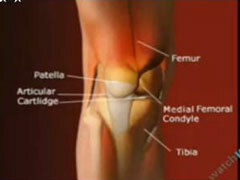 This, they explain, could induce high loading forces on knee joints. Moreover, they observed a decrease in ankle movement and inversion while running that correlated with heel height, which would be linked to a greater risk of sprain. The researchers suggest that the higher the heel the greater the risk of an ankle sprain if running. Perhaps more worrying than an ankle sprain in the long-term is that their findings suggest that the regular use of high-heeled footwear may contribute to osteoarthritis of the knee joints. The greater movement and force focused on the knees while running in such footwear being the major risk factor. Although the team studied only a small group of women aged 21-25 years in laboratory conditions, it is likely that other people wearing heeled footwear would be exposed to the same risks of injury and joint wear and tear.